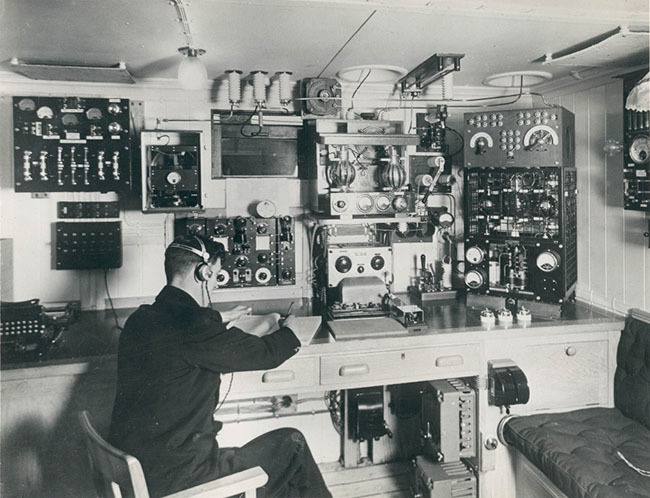 photo: Shipboard Radio Room in the late-twenties - note the vacuum tube transmitter in the right corner of the operator's desk. In the late thirties, it was becoming apparent that a replacement receiver was going to be necessary for the aging series of longwave receivers used by the Navy at that time. The receivers included the RAA superhet from 1931, the RAG TRF from 1933, the RAK TRF with regenerative detector from 1935 and the various upgraded versions of these receivers that were built on later contracts. The new LW receiver design was going to blend the advantages of the TRF plus tracking BFO design of the RAG receiver but built with modern circuits. Using a TRF with tracking BFO was advantageous in keeping the leakage radiation on the antenna to a very low level that prevented enemy direction finding equipment from determining the location of the receiver. Additionally, the low-level of radiation allowed the receiver to operate in the presence of other receiving and transmitting equipment along with radar equipment without interference. The tracking BFO design utilized a section of the main tuning condenser so the BFO tuning condenser was ganged to the main tuning. Since the new receiver was not a superheterodyne, the BFO had to track at 1kc above the tuned frequency allowing a 1kc heterodyne to be heard thus allowing CW to be readily copied. There were a couple of very good reasons for not designing the new LF receiver as a superheterodyne. First, was to provide complete coverage of the tuning range of 15kc to 600kc. Most IF amplifier sections utilized around 400kc to 500kc for the intermediate frequency, right in the middle of the most used portion of the medium wave band (as far as the Navy was concerned.) Operation of the IF amplifier at, for example 455kc, would eliminate a section of frequency coverage of about 20kc either side of the intermediate frequency. Some superhet LW receivers moved the IF above the intended tuning range (15kc to 600kc) but there were disadvantages to this solution to the problem. For example, the RBH receiver uses an IF of 1500kc but any transmitting activity around 1500kc will "leak into" the IF section of the receiver and cause heterodynes throughout the tuning ranges. 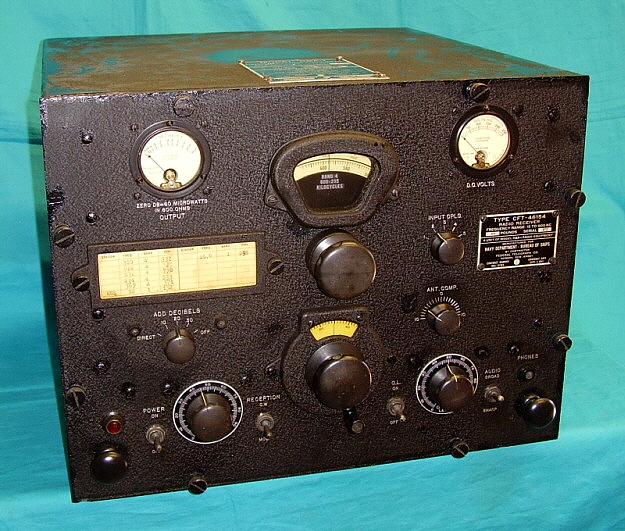 1945 RBA-6, CFT-46300 - The RBA-6 came from the factory painted Navy Gray and in a rack mount cabinet. The separate power supply is the CRV-20130, which is the same power supply used for the 15 tube RBB and RBC superheterodyne receivers. The CRV-20130 provides the filament voltage and B+ requirements via an armored cable with heavy-duty connectors. The power supply will easily operate two RBA receivers for emergency conditions and two separate connectors are provided. The power supply has a cold-cathode regulator tube (OC3) and a HV rectifier (5U4.) The RBA uses eight tubes, three 6SK7 RF amplifiers, one 6J5 Triode Detector, one 6SK7 BFO, two 6SJ7 AF amplifiers and one 6K6 AF Output. 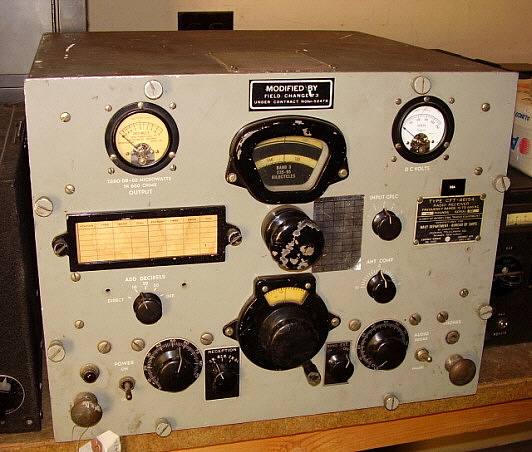 Table top versions of the RBA receiver were identified as C(FT)-46154 (FT would indicate that Federal Tele. & Radio Corp. was the contractor) and CFT-46154-A (RBA-5) while the rack mount versions are identified as CFT-46300. 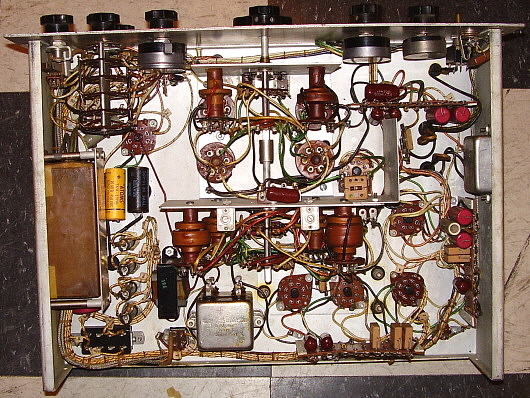 Internally, all versions of the RBA receiver circuit are the same. 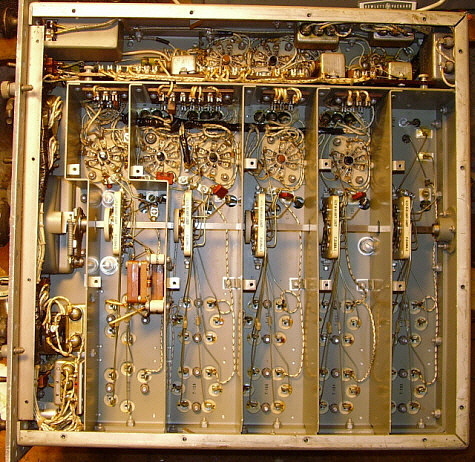 photo left: Inside the RBA-6 receiver showing the top of the chassis. All of the TRF coils are in the cylindrical shielded cans to the left. The moveable covers on top of the cans allow access to the trimmers for alignment. The two front coils are for the tracking BFO. Note the gear-driven potentiometer coupled to the main tuning. This is the auxiliary gain control that allows for constant gain across the tuning ranges. Also note the shielded meters. The blue "dots" on the tops of the tubes are my indicators that I have tested these tubes and they are in good operational condition. photo right: The underside of the RBA-6 chassis. Full shielding of each RF section is provided when the bottom cover is installed. The heavy-duty band switch uses ceramic mounts with .25" silver-plated contact buttons. All components are mounted on terminal boards or are mounted directly to the chassis. Tracking BFO is the front section of coils. RF3, RF2 and RF1 are next going towards the rear. The rear-most set of coils are the Antenna Input coils. The RBA-6 shown is from a 1945 contract. 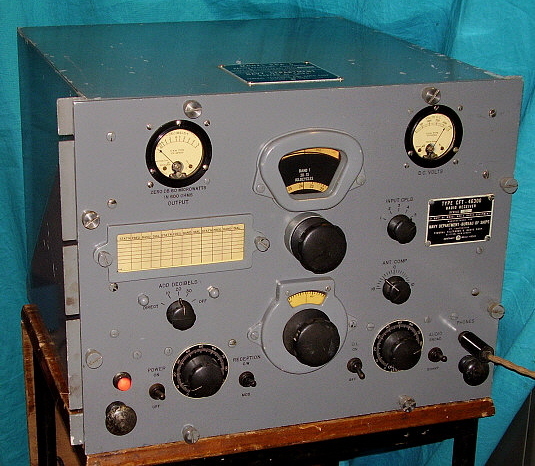 This version is identical to the RBA-5 internally but the RBA-6 is a rack mounted configuration only and is painted smooth Navy gray rather than black wrinkle. Judging by the condition of this receiver, it is unlikely that it was ever put into service. It is all original except for the substitution of an SO-239 UHF connector in place of the Navy coax connector for the antenna input. The RBA-6 is an impressive performer with ample sensitivity, direct dial read-out with illumination and a tracking BFO rather than regenerative-autodyne detector. The tracking BFO actually works quite well for finding the carrier on weak NBDs. The dial accuracy is excellent and allows tuning the NDBs by frequency rather than constantly referring to charts or graphs. The LP filter does limit the audio frequency response on BC stations but not to the point where the voice is incomprehensible. The O.L. works quite well at limiting the maximum output (which is usually due to static bursts) while not distorting the signal. The RBA-6 is a first-class longwave receiver capable of receiving any of the signals found below 500kc if used in an RF-quiet area with an appropriate antenna. RBA-6 Performance - I have been using this RBA-6 during the morning hours for late September through most of October 2009 and have found the receiver to be a phenomenal performer. I can usually separate LLD 353kc in Hawaii from local Reno AP NDB NO 351kc and this is using just a wire antenna and not relying on the directional characteristics of a loop antenna. That's amazing selectivity for a TRF receiver. I've probably tuned in well over 100 NDBs but so far only two were new copies and they were West Coast NDBs. The wire antenna I'm using is the 135' center-fed dipole with 43' of open feed line that is shorted together at the receiver antenna terminals. This antenna, while not really something I designed for LW, seems to work quite well with all of the LW receivers. Radio Rossii 279kc is received every morning coming in very strong - Russian LW station located on Sakhalin Island. JJY also can be received every morning on 40kc coming out of Japan. Noise is the only limitation on reception and for better noise reduction I have to run a loop antenna. January 21,2010 - I finally got the RBA-6 up to the top floor of the house where it can be used with the six-foot loop antenna. I had tried using the loop antenna in the basement but the concrete floor and the rock foundation were a serious detriment to the loop's performance. The top floor of the house is actually about 30 feet above ground level and allows the loop to function quite well even though it is located indoors. The performance of the RBA-6 on the loop is amazing. The signals just jump out of a fairly quite background noise level. Much quieter than running on the wire antenna. Most frequencies seem to have at least three NDBs active and by tuning the loop I can usually enhance one or the other to allow copy. Quite an improvement in performance. November 7, 2013 - QTH is now Dayton, Nevada and the antenna is a 300 foot long end-fed wire up about 50 feet. This antenna works quite well with the RBA-6 although the noise level is probably higher than using the loop. However, the actual ambient noise level is so low in Dayton that the 300 ft wire seems to provide better signal levels than the loop ever did in Virginia City. More info to come,... Nov. 8, 2013 0615 PST tuned in JJY at 40kc, very loud signal. 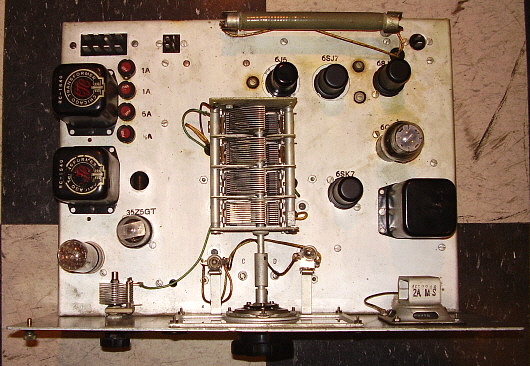 RBA-1, CFT-46154 - I had the receiver shown to the left for a short time. It's the early table top version RBA-1, the CFT-46154. This particular RBA-1 has had a common Field Change Modification Contract installed that changes the toggle switches for Reception mode and Output Limiter to knob-type controls. There are additional changes internally. The B+ meter has been replaced on this receiver. Additionally, like many receivers that have gone through a field rebuild, the cabinet is black wrinkle (it is for an RBA-1) while the receiver's panel has been repainted gray. This RBA-1 was traded off in 2015. I acquired RBA-1 CFT-46154 SN: 972 (shown to the right) from a fellow in Texas in October 2017. It was shipped to Nevada via UPS. No damage was sustained during transport. I purchased this particular RBA-1 because it was the first all-original, black wrinkle finish, complete example that I had ever come across. Most RBA receivers found around here look like the RBA-1 shown in the photo above. That is, most have the Field Change modifications and have been repainted gray. Not that SN: 972 didn't have problems. For example, the DB meter glass was cracked to several places. The meter, however, worked fine. Band switching from Band 1 to Band 2 was normal. To Band 3 felt rough, like fine gear teeth meshing and switching to Band 4 was stiff but it would switch. All toggle switches seemed to function okay. There was a little bit of dial drag on the logging dial which was slightly rubbing against the housing. Inside was very nice with all shields present. Some very minor corrosion in just a few locations - nothing serious. Even the antenna input was still the original Navy coax fitting. Cosmetically, the cabinet was very scratched up with quite a bit of paint missing, especially on the top. Front panel was very good with some minor blemishes and old touch-ups. The dial mask on Band 4 needs some attention as there are some "pin points" of corrosion present. All knobs were present but the spinner was missing from the tuning knob. The two nomenclature panels were in good condition. All tags were present and in good condition on both the panel and cabinet. The original tuning chart was present with NSS (WWII Radio Central USN, Annapolis, MD,) shown at 18kc. This RBA-1 didn't come with the CVR-20130 power supply or the armored power cable. Fortunately, I had a spare 20130 and a spare cable to apply power to this receiver. Normally, I wouldn't apply power without a thorough check out first, but the seller told me he had the receiver operating, so there was some confidence that nothing serious was going to happen. I did check all of the tubes first and ended up replacing three. I had SN:972 out in the shop, so I connected my 275 ft CF dipole with the 77 ft of feed line shorted to act as the antenna. Upon power up and warm up, the receiver was receiving KTHO 590kc up a Lake Tahoe quite loud. I had a 600Z ohm modified LS-3 connected to the phone jack on the front panel. Further tuning had MOG 404kc, a NDB from Montegue, CA and FCH 344kc from Fresno, CA coming in strong. This was about 3PM, so no DX NDBs were heard. However, when switching to Band 3 the output was nil, same for Band 2. Switching to Band 1 the receiver again had output. NAA on 24.0kc was strong but NLK on 24.8kc was extremely strong. NPM on 21.4kc was strong from Lualualei, Hawaii. So, this RBA-1 is somewhat functional. The most serious problem is the non-operative Band 2 and Band 3, however since the receiver works on Bands 1 and 4, the problem is certainly in the RF stages ahead of the detector. Additionally, repairing the mechanical issues of the band switching "roughness" and logging dial drag will be necessary. The DB meter glass repair will be accomplished by replacing the entire housing - it's a Weston Type 506 and they're common. Finally, when fully functional, a complete alignment. Cosmetics will be necessary too but that looks to mainly consist of cleaning and touch-up. photo above: RBA-1 SN: 972 "as received" Oct. 11, 2017. 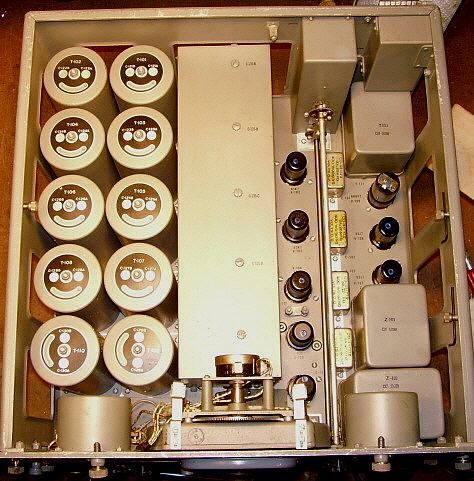 Note the bubble-wrapped tubes piled up on the RF coils. Some of the cabinet can be seen to the right. This photo was taken before the power-up test. Accessing the Dial Mask and Band Switching - With the front panel off, I could see the housing was a two-piece assembly. The front part of the housing was mounted with four screws. The next step is to remove the four screws and lock washers that mount the front cover of the housing. Now the front cover can be removed and this exposes the tuning dial and the band switch arced gear. 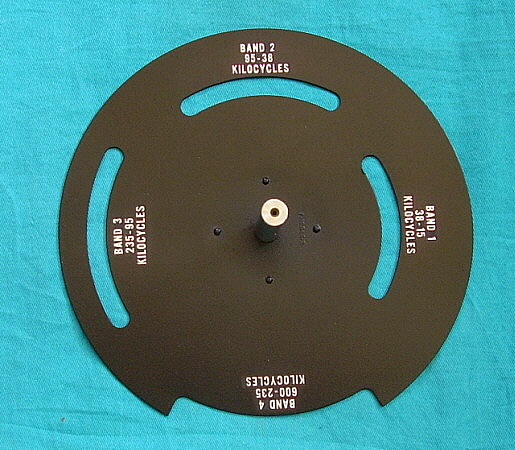 The dial mask is mounted to the front cover. In addition to the dial mask there is also a gear on the back side of the mask that engages the band switch arced gear and actuates the band changing function. However, since the mask needed to be restored it had to be separated from the front cover. This required removal of the retaining collar that was mounted to the band switch shaft. The set screw wasn't a hex like all the other set screws had been. This set screw was a spline or Bristol-type. Also, just to make removal difficult, the collar was pinned to the shaft. This required driving out the securing pin with a proper size punch. If done correctly with the proper tool, the pin comes right out. The collar has to be placed on a large vise that has the jaws slightly open. With a long thin diameter punch, the pin can be driven out. The set screw was only to keep the collar in place while the pin hole was drilled and the pin driven in. It doesn't have much of a purpose now and was easy to loosen. 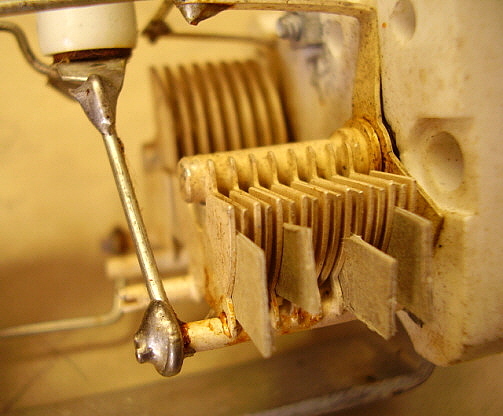 This allowed the collar to be removed and the dial mask, band switch shaft and drive gear could be separated from the front cover. Painting the Dial Mask - Once the dial mask was removed its condition seemed a little worse than I thought. The minor flecks of corrosion were numerous but most of them seemed to be around BAND 4. I removed the black paint with stripper and wiped everything down with denatured alcohol. I worked over the surface with steel wool to be sure it was smooth and no blemishes would show when repainted. I used Krylon Flat Black for the paint as the initial coat. photo right : The dial mask/cover assembly removed exposes the dial and the arced band switch gear. Dial Mask and Band Switch Reassembly - I put a small dab of grease on the mask shaft and installed into the front cover of the housing. The washer and collar were then installed onto the shaft and the collar pin installed. The spline set screw was tightened. The band switch was set on Band 2 so the mask was rotated to show Band 2 also. The front cover was carefully placed in position and moved slightly until the gears meshed while the mask remained showing Band 2 centered. The four screws were installed. The adjustment for the gear mesh clearance is accomplished by moving the front cover upwards (reduces mesh) and tightening the screws. Testing switching showed that the mesh was correct as the switching was ultra-smooth and not binding. Front Panel Restoration - This is really just a thorough cleaning with a brass wire brush (suede shoe brush) and Glass Plus to remove all dirt, grime and cigarette residue. The original wrinkle finish is very tough and can take this type of cleaning but you can't be real aggressive. You just want to remove the dirt not the paint. 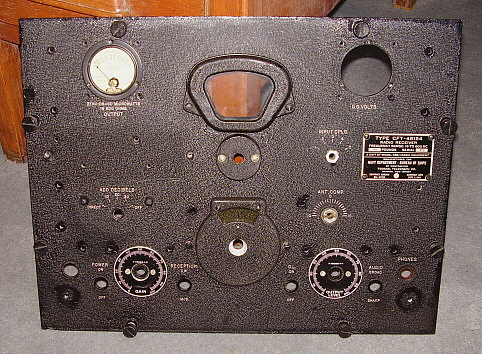 The front panel had been stripped of all tags and the two dial covers. The silver (engraved) nomenclature needed substantial cleaning. The front panel must have been pretty dirty as it took about five cleanings until the paper towels didn't turn gray with dirt and stayed fairly white. After this many cleanings, the nomenclature was very legible now. Next is the touch-up. I've been using jet black nitrocellulose lacquer for the last year or so. This method replicates how the USN did "touch-ups" on equipment that was being repaired but was not in the depot for an echelon-type rebuild. The lacquer looks too dark when being applied but with the final wipe down with 10W machine oil, the jet black matches the original wrinkle paint color quite well. 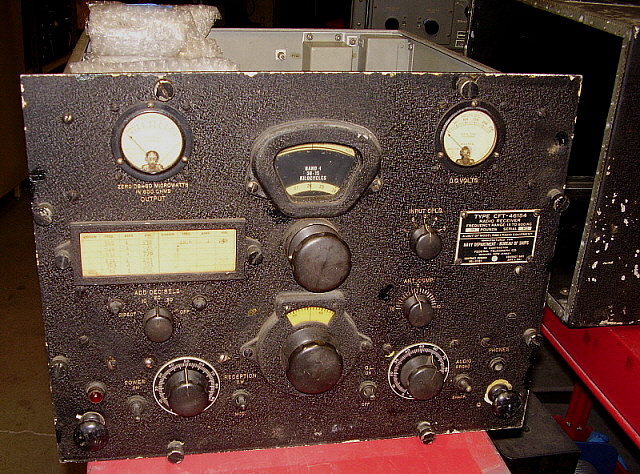 The touched-up front panel is shown to the right. Plastic Used in Logging Dial Window and Tuning Chart Cover - These transparent plastic pieces are made of a celluloid-type of plastic that is very sensitive to water. Just plain old H2O will "fog" the plastic. The more water added, the worse the fogging gets. With enough water, the surface of the plastic will begin to dissolve. The only way to clean the plastic used in the Logging Dial cover and the plastic used for the Tuning Chart cover is to use oil. I used 10W machine oil (3 in 1 oil, actually.) The oil cleaned the plastic surface and didn't cause any change in the transparency. Another note on the Logging Dial window, if this piece is dismounted only leave it dismounted for enough time to clean it and the dial housing. This plastic piece is fairly thick and if not secured by mounting screws it will quickly begin to warp. I noticed the warp starting in about 15 minutes, so I remounted the plastic to allow it to retain its proper shape. Front Panel Remount - I had to touch-up all of the panel mounting screws with black lacquer. Several were missing all of their paint but most just had chips of missing paint. I mounted the two meters after I had touched-up their mounting screws (and washers.) The most difficult part of the front panel remounting is installing the two chassis shims. These two pieces are mounted by the six horizontal chassis screws. I had to have the six screws protruding thru their respective panel holes to hold the two shims in place while I guided the front panel into the proper position to fully seat against the chassis and the side panels. I also had to guide the four toggle switches along with the Gain control and the Output Level control thru their respective panel holes in order for the panel to fully seat. Once the panel is seated all of the other panel screws were installed. All but two of the panel to chassis mounting screws have nylock nuts that complicate the panel installation, especially the six horizontal chassis screws that have four of the nuts difficult to access with a wrench. I first installed the other panel screws and nuts but didn't fully tighten them. They were holding the panel in place but allowed for minor movement. For the six horizontal screws, the easiest method was to have the receiver upside down as this allowed the best view of where the nuts had to go. Once the nuts were installed I still didn't fully tighten the screws yet. I still had to install the screws that mounted the chassis withdrawal knobs. Once I had all of the panel mounting screws and nuts installed and threaded together, then I could go ahead and tightened all of the panel screws. Each toggle switch had an flat washer, a hex nut and a dress nut for their mounting. The switches and two controls use external star locking washers that are mounted on the back side of the panel and flat washers and hex nuts are used on the front. The phone jack uses a special fiber insulator that has a locating pin that has to be inserted into the mating hole in the back of the panel. The phone jack body front just fits into the recessed channel which keeps the phone jack from turning when the panel nut is tightened. I had to make sure that two fiber washers and one metal dress washer were used when installing the phone jack nut. This was to provide the correct chassis insulation and the proper spacing so the phone jack nut would tighten up. Reassembly Notes - When I installed the metal spacer for the band switch shaft I had to make sure that the spring washer was mounted on the band switch shaft with the "fingers" facing up so it pressed against the recessed area behind the spacer. 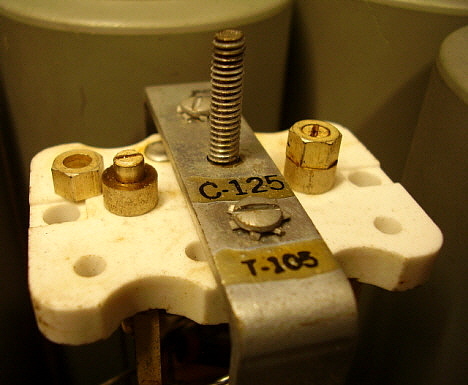 This spring provides a thrust load on the band switch shaft. When installing the logging dial, it also had a spring that mounted on the tuning shaft and loaded the logging dial. To synchronize the logging dial, I first had to set the main tuning to the minimum frequency on any band. I noted that the logging scale actually is a little longer than the tuning scales but I had to set the main dial to "0" on its logging scale. I then installed the logging dial on the tuning shaft with the load spring in place. I set the logging dial to read "0" on its scale and pressed the logging dial firmly as far back onto the shaft to load the spring and then tightened the set screws. I installed the logging dial cover and checked the operation for any rubbing or binding while tuning. I also checked that each 100s segments on the main dial's logging scale matched the logging dial at "0" or within a couple of divisions of "0." I then installed the meter covers and then cleaned and installed the knobs. I was pretty sure that during reassembly, with tightening up the panel screws and the other mounting screws, some paint chips were going to "pop off." I ended up with two fairly large chips and several smaller chips. These were touched up with black lacquer. With everything back in place, retesting and troubleshooting the Band 2 and Band 3 problems could begin. Oct 22, 2017 Minor Troubleshooting - Problem one was with the DC Voltmeter reading very low. Pressing on the meter face gently would result in the voltage reading going up to normal, +220vdc. The problem was that I just reinstalled the lug connections and didn't clean them first. Cleaning with a brass wire brush got the terminals and lugs clean and when reassembled, the voltage reading was normal. Problem two was that the ANT. COMP. control wasn't indicating the air variable position correctly. The ANT. INPUT shield has to be removed (easy to do - only four screws) to see the plates of the condenser. I set the condenser per the manual,...full mesh is 10 to the right side of the scale. There's a rotation limiting pin on the extension shaft thru the front panel that only allows 180 deg. of rotation so the air variable position has to match the panel scale. Repairing Split Hex-Collars on Air Variable Trimmer Capacitors - So far, the problems had been minor stuff. I was now going to find out why Band 2 and Band 3 were inoperative. I could hear a few signals on Band 3 but they were very weak. Band 2 was dead. I used a RF Signal Generator to inject a RMS voltage into the Antenna Input to act as a steady, high-level signal. When adjusting the trimmers to resonate the RF coils, the problem became "painfully" obvious,...on Band 2, two of the air variable trimmers had split hex-collars and the trimmer rotor had dropped down and was "shorting" the rotor to stator plates which shorts the RF coil which in turn takes the grid of that RF amplifier tube to ground. I adjusted the rotors until they were fully un-meshed which removes the short circuit but leaves that RF coil "not tuned" and the rotor too low to mesh with the stator. Enough signal leaks thru to tell that these are the defective components keeping Band 2 from operating. I found that Band 3 had one split hex-collar trimmer that was already un-meshed. This was why Band 3 seemed to work but had weak signals. Only Band 1 and Band 4 had all good trimmers. The repair of these split hex-collar trimmers requires the removal of the defective RF coil assemblies. First remove the shield-can by removing the top nylock nut and the four screws at the base of the shield. Removal of the actual RF coil assembly can be fairly difficult due to the 16 gauge buss wire used for connections. This requires a fairly large soldering iron (or gun, I used a Weller 250W gun.) On most of the buss connections the wire is wrapped a half turn around the terminal. On some wires, the joint can be heated and the buss wire lifted off of the terminal with large needle nose pliers. Other joints may require the use of a small pointed tool (like a small awl) to get the buss wire bend started once the solder was molten. At this point, long needle nose pliers can slightly unwrap the buss wire from the terminal and then it can be lifted off of the terminal. There are four buss wires and two stranded wires per coil assembly that need to be removed. Once desoldered, then the nylock nuts can be taken off and the coil assembly removed. Be careful when doing the reinstallation of the buss wire onto the terminals. If the buss wire was unwrapped too much it may break when bending it back into position. Try to only unbend the buss wire slightly when removing and then no problems should be encountered when reinstalling. photo above: The hex-collar on the right is correct and not split. The hex-collar on the left is split and has been taken off to show the trimmer rotor shaft. photo above: Cardboard shims are installed between the rotor and stator plates to maintain proper spacing for repair An ideal hex-collar repair would require access to a machine shop to make a new hex-collar from 1/4" brass hex stock. The shaft on the trimmer condenser is slightly tapered from 0.152" up to 0.154" and this requires that the hex stock have a slight taper also. The height of the collar is also important since the press fitting of the collar will stop when the adjusting slot of the rotor is at the top of the collar. This fit then has to result in the proper spacing of the rotor and stator plates. Original dimension for the height of the hex-collar was ~0.190" and the new collar would also have this same dimension. The final measuring involves having the hole perpendicular to the top and bottom surfaces of the hex-collar to allow even movement of the adjustment without binding. It's also possible to correctly position the split hex collar on the shaft and then drill and pin the collar to the shaft. The split should be perpendicular to drill hole for highest strength. A very small diameter steel pin will be necessary since the shaft is only about 0.154" in diameter. The pin should be an easy "press fit" since it's only holding the collar in position on the shaft. Either of these two repair methods are impractical for most restorers because we don't have access to a machine shop. The next repair method described doesn't require any special tools. An easier repair of the split hex-collar is to use solder to hold the hex-collar in place with the proper spacing for the trimmer plates. Cardboard shim stock installed between the rotor and stator bottom plates will provide a firm stationary spacing for the plates. A minimum of four shims should be used for best support of the rotor plates. I used .022" thick cardboard that can be salvaged from small boxes or the cardboard backing from tablets or from many other sources. As long as the shim thickness is about .022" the plate spacing will be correct. The first step is to remove the RF coil assembly from the receiver. I've tried to do this repair with the coil assembly in place (just the shield-can removed) and it is almost impossible to get the cardboard shims installed. There's just not enough space for access and there's limited visibility, making the whole operation impossible. Although it's difficult to unsolder the 16 gauge buss wiring to remove the RF coil assembly, it's easier than trying to do this procedure with the coil assembly still mounted in the receiver. Once the RF coil is removed, installing the shims is easy. I use a pair of channel locks to gently lift the rotor (with the hex collar installed so it will only move just high enough.) I then slide in four shims. Now, release the channel locks and remove the hex-collar. The slotted end shaft will be at the correct height (for the hex-collar to be sweat-soldered in place.) The slotted end of the shaft has to be cleaned with a small jeweler's file but don't clean all the way down to the stationary spacer. Just the upper half of the shaft should be cleaned. Add some slight grooves with the file for the solder to adhere to better. The inside of the split hex-collar must also be cleaned with the small file. I used a large soldering iron to "tin" the slotted shaft (250W Weller.) If the hex-collar now won't fit on the shaft then file off some of the solder until the hex-collar does fit entirely onto the shaft with the bottom of the hex-collar flush with the stationary spacer. Heat the hex-collar and shaft with the soldering iron until it's hot enough that a very small amount of solder can be melted. This solder will be wicked between the hex-collar and the shaft and should provide a very strong bond. Add a little more solder to the top slot area and create a slight solder "dome" on the top. Let the solder cool and remove the shims. photo right: Finished hex-collar repair showing the slot cut to allow adjustment of the trimmer when RF coil is fully assembled. Trimmer Capacitors Split Hex-collars - Notes - This splitting of the hex-collar on this style of trimmer condenser is fairly common. This type of trimmer was very popular in the mid-thirties up into the mid-forties. They're found in Hammarlund Super-Pro receivers, all BC-348 receivers other than Q, N and J versions, Navy RBB and RBC receivers, on and on. It's likely the problem is due to poor storage conditions and metal fatigue due to age. When the metal was new the hex-collar could expand and contract with varying temperature cycles. However, years and years of thermal cycling will cause the metal to become brittle and eventually it will crack. Poor storage in garages or sheds only results in thermal cycles that are even more extreme and rapidly cause the metal to become brittle. There isn't much that can be done today except to repair the trimmers as they are encountered. Alignment - The hex-collar trimmer repairs resulted in the RBA-1 now being fully functional. The receiver requires a specific "dummy antenna" to load the input regardless of the impedance of the signal generator. Luckily, the schematic of the "dummy antenna" is included in the NAVSHIPS manual. The parts required are one 20uH inductor, one 400 ohm carbon resistor, one 200pf capacitor and one 400pf capacitor. The schematic is shown to the right. The trimmers are all adjusted at the top end of each band. For example, on Band 4, set signal generator to 600kc. Set receiver to 600kc. With signal input to antenna input thru dummy antenna, adjust all Band 4 trimmers for maximum deflection of the DB meter. Reduce the GAIN control to compensate as the signal level increases. Use lowest signal input that gives an indication on the DB meter set at the lowest scaling. This is repeated for each band. >>> There are adjustments for the BFO inductance for each band that are "thru the front panel." 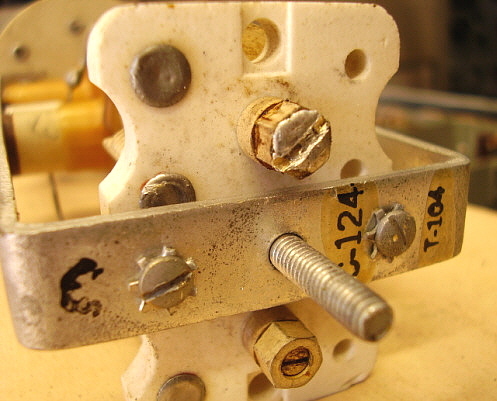 Two holes are under the tuning chart (Left = BFO 3 and Right = BFO 1) and the two other holes have acorn head screw plugs that are removed to access the holes (Left = BFO 4 and Right = BFO 2.) Adjust BFO 4 inductance for a 1kc heterodyne, if necessary. Check both the upper and the lower frequencies to verify that the BFO is actually 1kc higher than the tuned frequency. Tune the receiver up about 1kc higher in frequency and the BFO should be zero beat if it is set 1kc higher than the tuned frequency. Repeat the adjustments until BFO tracks. Repeat the procedure for each band. Is the Dummy Antenna Really Necessary? 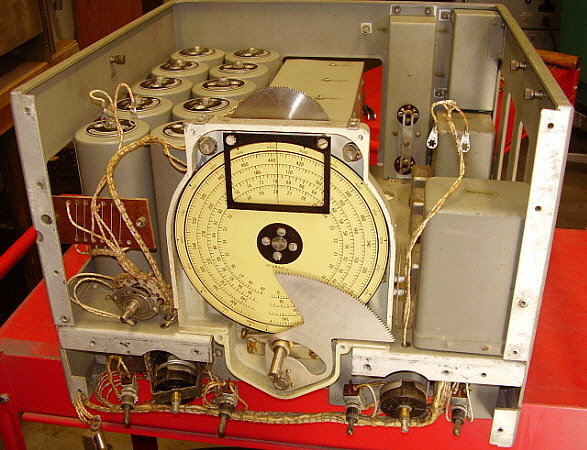 - When the RBA-1 was in service and being aligned at a USN depot, it was unknown to the radio repair technicians what type of antenna was going to be connected to the receiver. Shipboard antennae were quite different from USN land station antennae. What the Dummy Antenna does is provide a somewhat constant impedance load to the receiver that behaves more like a typical antenna would than a direct connection to the Signal Generator output would. The variability of what type of signal generator was used probably also entered into the alignment problems. Using the Dummy Antenna generally ensured that every RBA would come thru alignment with the same performance specification regardless of where it was going and what type of antenna it was going to be used with. Today, most of us are going to use one specific antenna with the receiver. If it's an end-fed wire of considerable length, it might be better to align the receiver with this antenna connected. Couple a signal generator output to the receiver's antenna input by using a small "antenna" on the signal generator output consisting of a three foot wire that's near the receiver. This will provide a frequency specific signal that can be adjusted for amplitude, frequency and modulation (if needed.) This simulates the receiver actually "picking up" a transmitted signal and aligning the receiver for the best operation with the antenna the is going to be used. In this type of set-up, the load of the antenna is just as it is when the receiver is in operation. This then provides an alignment that is exactly for the actual antenna that is going to be used. Tuned loops are a bit more difficult and experimentation would probably be best with these types of antennae. Usually, the loop can be tuned for the highest frequency on the band and then the receiver aligned to that impedance load. Since there is no alignment adjustment for the low end of the band, check to see if when the loop and the receiver are tuned to the low end of the band that the performance is the same as the upper end. When experimenting with various antennae and alignment, only the antenna coils will be affected and only those coils will require adjusting. Cabinet Restoration - I really didn't want to do an entire respray of the cabinet. If I did, it wouldn't match the receiver front panel. There was a lot of paint missing, especially on the top. The first step was to remove the two data plates and then to clean the cabinet's remaining paint with a brass wire brush and Glass Plus. I then used black nitrocellulose lacquer to repaint all of the areas that were bare metal. I let this set for a day. The next step was to mix a very thin batch of lacquer and thinner - about 2:1 ratio. With gloves on, I then used a cotton pad saturated in thinned lacquer to "go-over" the entire cabinet. This hides the "touch-ups" and ends up with the cabinet looking in good original (although "touched-up") condition. I then reinstalled the data plates and installed the receiver into the cabinet. Antenna Connection to Navy Coax Fitting - These Navy coax fittings are not common making them difficult to find. There are two easy ways to connect an antenna feed line to the RBA (or the RBB or RBC) that allow use of coaxial cable and provide a good connection to the receiver. Use a double female SO-239 adaptor. The outer diameter will just fit into the Navy coax barrel. It will slightly "thread" itself and make good electrical contact. However the pin at the bottom of the Navy fitting is too far away to make positive contact with the center conductor of the SO-239 adapter. I usually roll .010" thick brass or copper sheet metal into a tube. The tube can then be inserted into the SO-239 adapter center barrel. The other end of the tube should be about a .375" extension and the open end of it will fit over the Navy center conductor pin. Another way to connect coax is to use a female banana pin plug (these do fit onto the Navy center conductor pin.) The coax center conductor can be soldered to the female banana plug. The shield can have a drain wire soldered to it and it can be connected to the ground lug on the back of the RBA cabinet. Performance - Since I had the RBA-1 set up out in the shop, I had to use the 270 foot long, center fed dipole. Since the antenna is fed with open transmission line, I just disconnected the two wires from the antenna coupler and, using clip leads, shorted them together and then used a single 14 gauge stranded wire to connect the feed line to the receiver. Perhaps this acts like a large "T" antenna that has the 77 feet of feed line acting somewhat as a vertical with a large 270 foot long "top hat." The "T" configuration was a popular antenna during the early days of radio. Other daytime copies included the USN MSK stations NLK 24.8kc in Jim Creek, WA, NAA 24.0kc in Cuttler, ME, NPM 21.4kc in Lualualei, HI and, although substantially weaker, HOLT 19.8kc in Exmouth, Australia. These are very strong stations that are easy copy, day or night. The INPUT CLPG and ANT COMP. controls are very important and must be adjusted for each band. In fact, the ANT COMP. should be peaked every 10kc or so. The following is a log of the stations tuned with the RBA-1 using the 270' CF with 77' of ladder line with wires shorted together. There are six listening sessions within about a seven week period that include both daytime and nighttime listening periods. With the six sessions, I tuned in 100 different NDBs of which six were newly heard stations. Greatest DX was DDP 391kc in Puerto Rico which isn't unexpected since it runs 2KW. Other DX (for a western US location) was FIS 332kc in Key West, FL, YMW 366kc in Maniwaki, Quebec and DB 341kc in Burwash Landing, Yukon. Daytime copy of British Columbia stations YZA 236kc and DC 326kc was unexpected but was certainly due to the time of year. Best LW reception is usually in November and December. The large antenna was probably also a factor. Maybe the RBA-1 was a factor, too. Antenna is 270' CF with 77' ladder line with feedline wires tied together. Height is 40 feet. Stations are listed in "as heard" order. Pacific Time. Newly Heard NDBs - Maroon with asterisk. Unless otherwise indicated, all reception is using 600Z ohm 'phones as audio reproducers. NOTE: Conditions were particularly noisy due to a passing storm front and wind causing severe antenna static. One of the problems with using an outdoor antenna. Even indoor loops will respond to weather fronts however. The static level was very low and these stations were easy copy on loudspeaker. This was at 1:30PM in the early afternoon! Xlnt cndx. One newly heard "LF 336kc" and 19 new copies for this receiver marked with #. NAVY-RADIO.COM - For the most detailed information WWII Navy Longwave gear and on all types and all vintages of Navy LW radio equipment, Navy LW radio stations with vintage photographs - go to www.navy-radio.com Nick England's incredible Navy-Radio website has the most information available. Mackay Radio & Telegraph Company was founded by Clarence Mackay, son of John W. Mackay, one of the "Big Four of the Comstock" fame in Virginia City, Nevada. 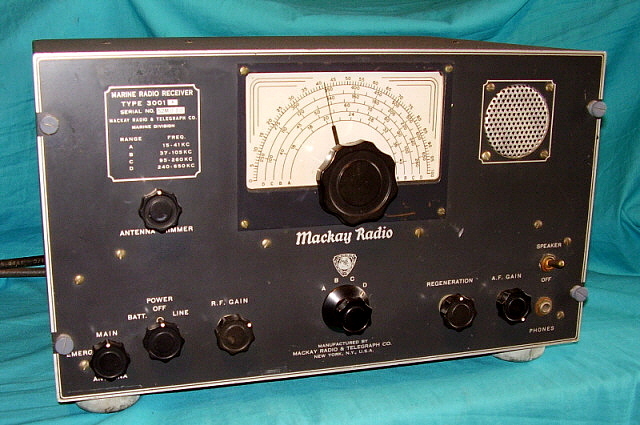 However, by the time this Mackay Radio receiver Type 3001-A was produced, International Telephone & Telegraph Co. had owned Mackay Radio for a couple of decades. 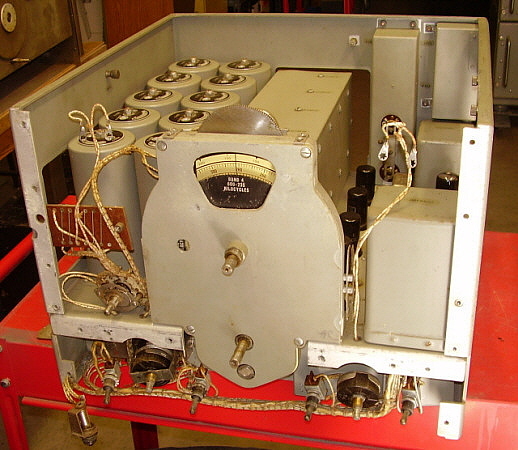 ITT continued to use the Mackay name in their marine radio equipment up until just recently, 2006.
photo left: Top of the chassis showing the Jones plugs that are for the power and signal inputs to the receiver. The large resistor is for operation on 12vdc for the filaments. photo right: The under side of the chassis showing the various coils and other components. This receiver was partially re-capped sometime in the past. This Mackay 3001-A was a ham swap meet find purchased in October, 2009. The design and construction of the Mackay 3001-A is obviously commercial and is no where near the "cost-no-object" designs and "over-built" construction that were used by the Navy. Still, the receiver is an impressive performer and has some interesting designs in the circuitry. Tubes used are 1 - 6SK7 RF Amplifier, 1-6J5 Detector, 2 - 6SJ7 AF Amplifiers, 1 - 6G6G Audio Output, 1 -35Z5GT Rectifier and 1 Amperite Ballast Tube. Interestingly, the detector input is also directly connected to the first AF amplifier since the 6J5 is acting like a diode. Each Detector coil has its own "tickler" winding which is routed back to the RF Amplifier's screen and is controlled by a 50K Regeneration pot. Selectivity is controlled by a combination of the RF Gain setting and the setting of the Regeneration - too much RF Gain results in very broad signals. Best performance is achieved using earphones with the AF Gain fully advanced and using only what RF Gain is necessary to hear the signal. Regeneration should be set just at the oscillation point or slightly into the oscillation range - which ever gives the best signal. The Antenna Trim will somewhat manipulate the signal tuning and can contribute to successful copy on very weak signals. The vernier reduction action of the main tuning dial seems a bit fast at first but in actual use the bandspread is wide enough that the tuning rate works out just fine. The 3001-A is a great little receiver (weight is only about 35 lbs) with excellent sensitivity and it is capable of receiving just about anything in the LW spectrum. Besides all of the normal NDBs, this 3001-A also has received the LW BC station from Sakhalin Island on 279kc and also JJY 's pulse-coded time signals from Japan on 40kc. The Navy NSRTTY station from Hawaii on 21kc and from Cutler, Maine on 24kc both can received quite well. An impressive receiver that doesn't challenge your back to move.